Inquire about the new Airstream accommodations. Entry Level Great room with Gourmet Kitchen,Hospitality Island, Bar(ice maker), Den. The home has panoramic views of the beautiful private valley and a walk to the ridgetop takes in the entire Estero Bay. A 20 yd 2 lane lap pool with baja step and spa that the owners share with their guests. Cottontail Creek Ranch raises grass fed cattle, Hass avocados, organic Valencia oranges, and kiwis on 850 acres of rolling hills. Roads and trails for hiking, walking, biking, and fabulous photography opportunities. 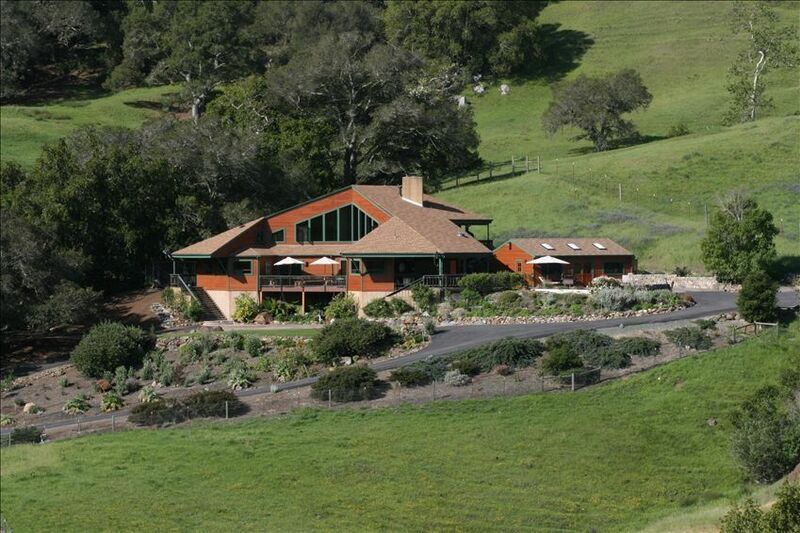 Close to the beach and to the Paso Robles wine country. Trails for hiking and wildlife viewing, large pond with catch and release fishing and kayaking. Spectacular views of Pacific Coastline from ridge tops. Pipe corrals for horse owners who want to bring their own horses to ride on the ranch or nearby public trails at Cayucos Beach, Montana de Oro State Park, or National Forest in Pozo. Horseback riding can be arrange with an independent wrangler. The beach is just 12 minutes away and nearby attractions include Hearst Castle,Cambria, Big Sur Coastline, Morro Bay, Paso Robles, and San Luis Obispo area wine tasting. Shopping and Farmers Markets in Cambria, San Luis Obispo, Templeton,and Morro Bay. Great windsurfing, surfing, biking nearby. Scheduled air service, United Express, America West and South West 35 minutes in San Luis Obispo. Fiesta ware and also china for a more fancy look. We have our fabulous reclaimed teak table that seats 12...we add different size tables depending on the numbers. Regarding wheel chairs: Although not perfect our home has welcomed many wheel chair guests. They have good use of the first floor and all the outdoor patios, upper and lower. From this level you can watch all the activity. Kid Friendly: We have a high chair, pack and play. The rec room is a great play room with some toys and city play flooring. Badmitton, volley ball, kick ball and frisbee. Horse shoe court down at the pool Detached multipurpose/workout/conference building with ping pong, weights, an eliptical trainer and double bed/futon couch. Satellite Networking/Surround Sound Stereo(Living room), 5 burner chef cook top, double electric convection/microwave ovens, Blenders, Coffee grinderd, toaster oven, 4/toaster, Cookware & Utensils, condiments, Separate Bar, Oakwood BBQ(wood provided), Fire Pit under the stars(wood provided), Cleaning service and child care available upon request for additional charge, Chef and Massage Therapist upon advance notice.